This recipe is quite simple and straightforward. Some sour cream adds some creaminess, however you could use some half-and-half or heavy cream instead. Since balsamic vinegar goes so well with tomatoes, we added just a touch. Make sure to blend this soup very well, it's best when it's completely smooth. There is nothing wrong with canned tomato soup, however once you've tried to make your own, you won't go back. 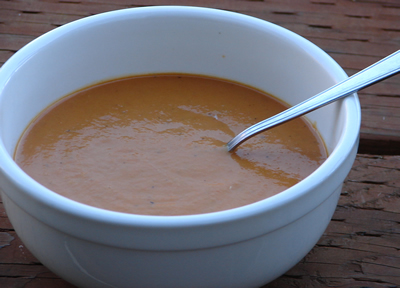 This tomato soup is very easy to make, yet tasty and satisfying. We used canned tomatoes, but if you happen to have a lot of fresh tomatoes on hand, you could roast them first, and then add them to the soup. Sweat the onion, celery and carrot in the oil and the butter. After about 10-15 minutes, add the garlic, the thyme, the bay leaf and the tomato paste. Continue to saute for a few more minutes and the add the diced tomatoes and the water + the bullion cube (or add 2 cups of broth). Bring to a simmer, and let cook for about 15-20 minutes. 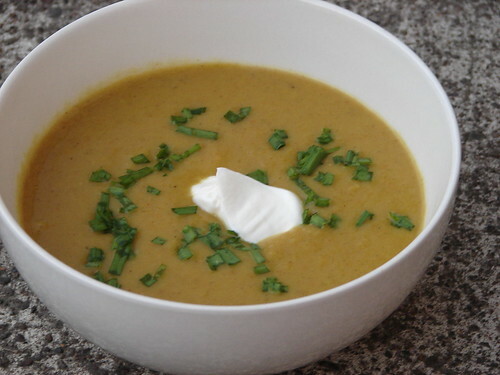 Blend the soup well, bring it back to the pot and add the sugar, the balsamic vinegar and the sour cream. Salt and pepper to taste.